The standing question here is whether abortion is a political issue. At first glance, Yes, abortion is clearly a political issue. Abortion is political in the sense that politicians debate the subject in campaign season, they broadcast their abortion views to win votes, abortion has been a deciding issue in the minds of many voters, and abortion easily fits within the broad sense of politics since most everything people do is political (useful directly or indirectly for an advantage in the democratic process). Without dispute, abortion is a politicized topic. But upon deeper reflection, abortion may be only nominally or secondarily political, having a deeper identity in ethics rather than politics. To understand this nuanced non-political sense we must first consider what is politics and how, in that sense, it remains deeply political. Politics, deriving from the ancient Greek word polis meaning “city state,” refers to matters of governance including laws, bills, political parties, elections, and so on. Elections are won and lost, sometimes, on the subject of abortion. The 2012 Democratic national convention ran a negative party-wide campaign titled, “Stop the Republican War on Women,” and that was (and still is) predicated heavily on abortion advocacy. The degree of abortion access, federal funding, legal history, support and opposition to abortion-on-demand, these have all been politically heated subjects. Political stripes have shifted over the years, variously accommodating and opposing abortion-on-demand, but today, wide and inexpensive access to abortion remains a key agenda item for much of the democratic party; and with it, a lot of libertarians, progressives, and socialists agree. Major abortion advocacy groups like Planned Parenthood (1916), National Organization for Women (1966), National Association for Repeal of Abortion Law (1969), and Emily’s List (1985) have tended, overwhelmingly, to side with democrats on matters of abortion access and funding, though many of them would prefer abortion access to be even more liberal than it is now (in the United Sates). Interestingly, in the late 19th and early 20th century, abortion was widely opposed by “Left” and “Right” alike. For example, Margaret Sanger, an outspoken socialist, contraception advocate, and founder of Planned Parenthood, broadly opposed abortion along with many of the early (first wave) feminists in that era (late 19th-early 20th century). Republicans, however, have largely rallied around social conservativism, typically emphasizing traditional family values, and anti-abortion positions, at least since the mid-1980’s. The Republican party’s uniform opposition to abortion, however, wasn’t until 1988, the crest of the Reagan years. The 1980 and 1984 Republican party platform leaned pro-life but still acknowledged that some republicans supported abortion choice. The social upheaval of the 1960’s and 70’s had radically shaken the republican foundations generating such odd outcomes as a 1971 Southern Baptist Convention pro-choice resolution. With abortion being so clearly fixed within politics, how could it possibly be understood as non-political? Abortion can be non-political in the sense that it’s moral grounding resides underneath even politics. Intentionally killing one’s own child-in-utero can be unethical, regardless of whether the government deems it legal or illegal. Abortion can be unethical even if there were no political comments for or against the practice. This is because morality isn’t legality. These are two distinct concepts. Ethicists have often admitted that “legal” and “ethical” are different. Laws of the land can be unethical, and good ethical practices can be illegal. In an ideal world, ethics and politics would overlap beautifully so that all laws were good and decent. But in the real world, they don’t always work out that way. Slavery was evil even when it was legal. And Cuban coffee is morally fine, but illegal to buy directly from Cuba because of trade embargos. In short, legal doesn’t equal moral and vice versa. Abortion can also qualify as non-political if it is wrong at an individual level, that is, regardless of society and government. Questions of government, judicial law, and politics all refer to society, but things like basic human rights can operate even if there is no organized society. If a cruiseship crashed on an undiscovered desert island, they would have no established government, and no civil society. Everything would be automatically legalized, as there would be no pre-established laws for that territory. Yet, most of us, and most ethicists and legal scholars can admit that it would still be wrong to kill innocent human beings in that setting. 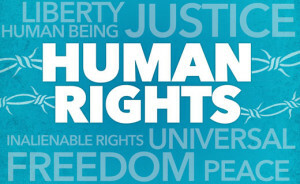 Human rights trace to our humanity and not just our society. Now, of course, people disagree about whether abortion violates any human rights. Pro-choicers argue that the child has no rights during at least some stage of development, with the rights beginning only at viability, pain-sensation, birth, or whenever the mother decides to keep the baby. Pro-lifers, on the other hand argue that elective abortion violates the child’s human rights, namely, the right to life. To this we could add other, human rights, such as the right against “cruel and unusual punishment,” or the right of due process, or the right against parental neglect, etc. But for now, we’ll just focus on the right of life. I have argued before (see the posted video), that abortion violates the basic right to life. So long as the child is a living human being–and biologically there’s no dispute about that–we ethically owe that human being the benefit of the doubt. In colloquial terms, “if you don’t know, don’t shoot.” It is not enough to demonstrate that the child perhaps, probably, or quite likely lacks the right to life. We should be reasonably certain that any given abortion is justified before permitting that abortion. The capital punishment that effectively occurs with every abortion is too heavy to hinge on a “maybe.” Not even the Roe v. Wade decision satisfied this criteria, however, as there was a 7-2 split decision. That ruling would not have been enough to bring a conviction in a capital murder case. Even one death penalty couldn’t have passed with a hung jury. Yet that fateful ruling has facilitated the death of almost 60,000,000 children-in-utero since Roe v. Wade. Presumably, if there is a right to life extending all the way to the earliest stages of human development, then the right to life is the most basic of any other rights. It would begin with the earliest biological fact of that child, namely, that child first becomes a distinct living human being at fertilization. The child is not old enough to qualify for civil rights like driving, voting, or military service. The child isn’t mentally developed to have “liberty” or the “pursuit of happiness.” And the child’s “personhood” status remains a hot topic of debate. But at that earliest stage of development the child-in-utero is already alive, with a distinct life of his or her own, a life which is not the same as the mother’s. Therefore, if that child has the right of life, it’s among the earliest moral facts about that child. Furthermore, the right to life, is presupposed within every other right. Only living humans have the rights of liberty, pursuit of property, the pursuit of happiness, voting rights, driving rights, etc. All these rights presuppose that the individual is alive, and has a right to keep his or her life rather than be killed (without due process) at the whim of private citizens, or the government. And so, we can make a case that abortion is non-political if it’s moral weight rests within a foundation of human rights. If abortion infringes on intrinsic human rights then regardless of whether a government deems it legal or illegal, then abortion is still wrong. It’s sub-political like that. It may sound like a contradiction to admit that abortion is political and non-political, but rest assured, we mean these in two different senses. Abortion is political in the common and normal sense of “politics as usual.” Abortion is clearly a chesspiece on the board of modern politics. It’s about as politicized as any subject can be. There is no use in denying this fact. And politically minded people have often admitted, with only slight exaggeration that “everything is political.” Generally speaking, that’s quite true. And abortion is no exception. However, underneath the legality and politics, is morality and ethics. Abortion bears upon human rights. 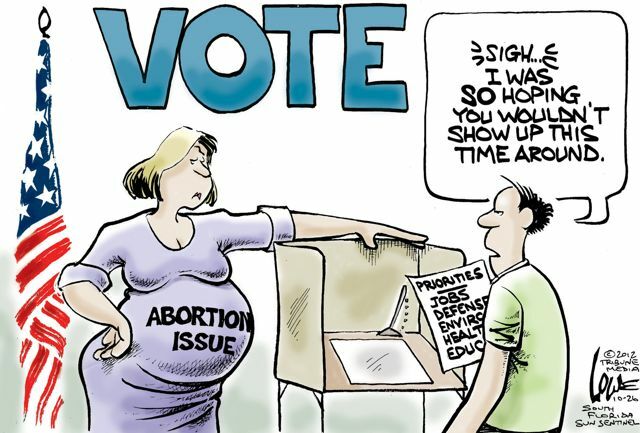 Prochoicers focus on it’s impact on the mother’s right of liberty (including privacy, sovereignty, and self-direction). Prolifers assert that it violates the most basic human right, the right to life. Prochoicers and prolifers are therefore justified in seeing abortion as spanning both political parties, defying “government as usual” because it’s foundation lies underneath political parties, judicial laws, congressional bills, and every government in the world. This “non-political” sense is perhaps better understood as “transcending politics” as it can operate regardless of politics, and could apply to individuals on a desert island, even if there were no government in place. In that sense, the ethics of abortion should inform our politics. Our politics should, where possible, reflect what’s ethically right. Unfortunately, abortion is all-too-often treated like a morally neutral token–a pragmatic piece of ideology, to be traded for votes and signatures. It’s as if abortion is nothing more than a partisan game piece. Indeed, this issue has been one of the most polarizing issues in modern politics, comparable to 19th century slavery. Not a few democrats vote pro-choice, keeping within the party lines, despite their own pro-life ethics. We could critique this “personally pro-life, publically pro-choice” logic, but that outlook is all too common among democrat and liberal voters. Abortion is clearly a partisan dividing line with most Republicans on the pro-life side and Democrats on the pro-choice side. Yet, despite all the party politics, abortion is more basic than all of that. If abortion is the crime against humanity that pro-lifers think it is, then politicians of every party, creed, and kind should be able to stand against it in good conscience. And given the magnitude of abortion–the single deadliest act against fellow man in human history–it is perfectly justified to be a “single issue voter” on abortion. Abortion may be one of the most politicized issues in Washington, but we must not forget that it’s too basic, too foundational, to submit to the simplistic trappings of politics. Abortion transcends politics, because the right to life is true regardless of government. This entry was posted in Abortion Laws, Ethics of Abortion, Philosophy of Abortion, Terms and Definitions, When does Life Begin?, Women's Issues and tagged civil rights, human rights, politics, republican platform. Bookmark the permalink.